Heard of it? I’ve known about this book for some time and also knew that it is recognized as the definitive book for independent artists looking to ace DIY Touring – its even used as a text book in some universities. What I didn’t know is how accurate it is for gaining success period. From the very start, this book helps you get clear on exactly what you want to accomplish and how to accomplish it! You won’t even know how valuable that is until you’ve done it! >>>>ALREADY FAMILIAR WITH THE BOOK AND WANT TO GET YOUR COPY NOW FOR 21% OFF ? Get it here: How To Be Your Own Booking Agent: THE Musician’s & Performing Artist’s Guide To Successful Touring (or the Kindle version HERE for only $9.99)! I’m proud to bring you this incredible book at a special reduced price! 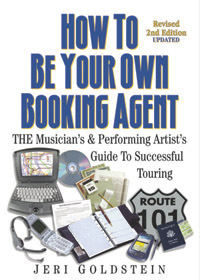 How To Be Your Own Booking Agent: THE Musician’s & Performing Artist’s Guide To Successful Touring (or the Kindle version HERE for only $9.99)!